Improve the rainging system and add a little bit more of wether realism. 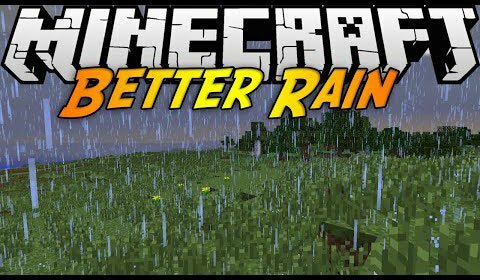 Better Rain 1.7.2 and 1.7.10 is a mod that aims to improve the whole system of rain in Minecraft and make it more comfortable for the player. This is made by reducing the volume of rain and adding new sounds to it. So that you will find that when is raining would that be a pleasure moment instead of bother you. Furthermore, the mod adds a random system of rain intensity, from drops, light raing to heavy rain. How to install Better Rain Mod for Minecraft 1.7.2 and 1.7.10? Improving the system of rain in Minecraft !